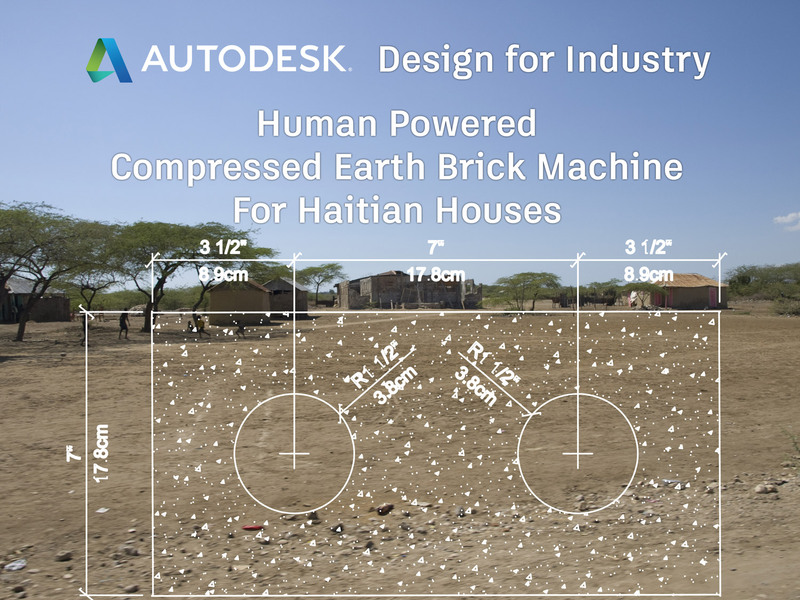 Autodesk is partnering with Ivy Tech and Commonwealth Engineers to bridge the housing deficit in Haiti. To help the effort, we are launching a state-wide student competition open to all Ivy Tech Students. The objective is to design a human-powered compressed earth block machine using Fusion 360. Students will have from January 22nd through March 29th to design their project (the Spring 2019 semester). All current, enrolled Ivy Tech Community College students are invited to submit their designs. Required - upload one or more drawings showing parts, listing components, recommend exploded view but not requried. Autodesk How-To video, YouTube how-to video. Consider machine yield per human operator. Can you design a machine that is easy to operate, and the force provided by one human is enough to compress at least one brick at a time. Machine must weigh less than 200 Kg (441 lb) so it can be lifted by 4 people. Ideal weight less than 100 kg. Machine should be transportable on back of pickup truck. 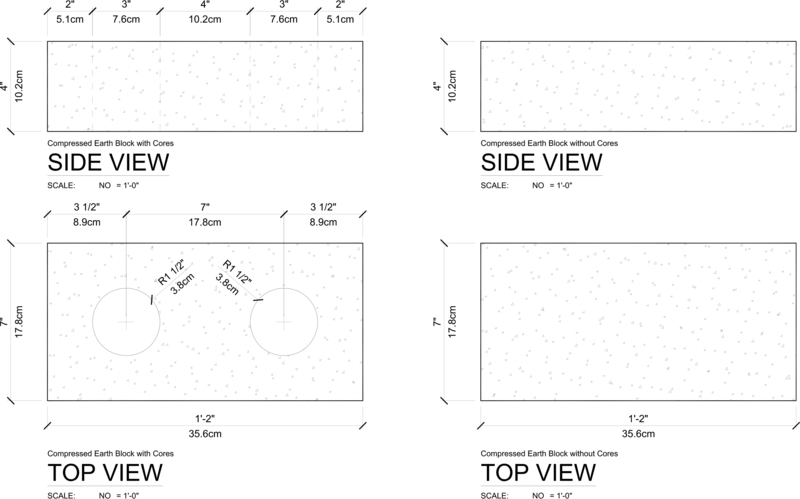 Compressed Earth Brick (CEB) must be 14" x 7" x 4"
Your projects will be judged by a panel of Commonwealth Engineers, Architects, Autodesk experts and Ivy Tech teachers. The winner will be announced on May 14th (last day of Spring Term). Design Solution (30%) - solution efficiently solves the design problem. For example: solution is capable to produce a high number of bricks on a short amount of time with minimum human effort. Fabrication (20%) - machine is easy to produce, replicate and/ or maintain. Machine is easy to assemble and to move from location to location. Machine requires minimum maintenance. Creativity (10%) - solution is unique and original and is an example of clever design solution. Entries that appear to be a clone of an existing CEB press will receive minimal creativity points. Points will be awarded for features and improvements that don't appear in existing commercial products. What is Design for Industry? Who Owns the IP? Design for Industry (or “D4I” for short) is a series of student design challenges run by Autodesk since Spring 2016. Each challenge features an partner company that proposes a real-world engineering or design problem for students to solve. In the process, students get feedback about their design ideas during the design creation period and on their final submissions. Students gain valuable insight from the partner about what’s important in their industry and on what will make a strong portfolio piece when applying for jobs, internships, and apprenticeships. Autodesk supports the D4I competitions through live webinars, in-person CAD training, online videos, and free software for students. Internships and jobs have been offered to winners after D4I competitions on a case by case basis. A panel of judges from the partner company, school faculty, and Autodesk will score entries using an online competition submission + judging platform. Cash prizes are awarded at the end of the challenge / semester. All intellectual property (IP) is maintained by the student designer (assuming it was not copied from a pre-existing design, in which case the IP may be owned by the original designer).